Newcastle United fans want the anniversary of signing Rafael Benitez to be a national holiday, after his side thrashed Southampton on Saturday. The Toon Army are now 13th in the Premier League table, five points clear of relegation. Southampton were completely outplayed and outfought on Saturday, as goals from Kenedy and Matt Ritchie secured an emphatic win for the Magpies. Sunday marked the two-year anniversary of Rafael Benitez taking over at the club, and needless to say the fans just can’t get enough of Rafa. 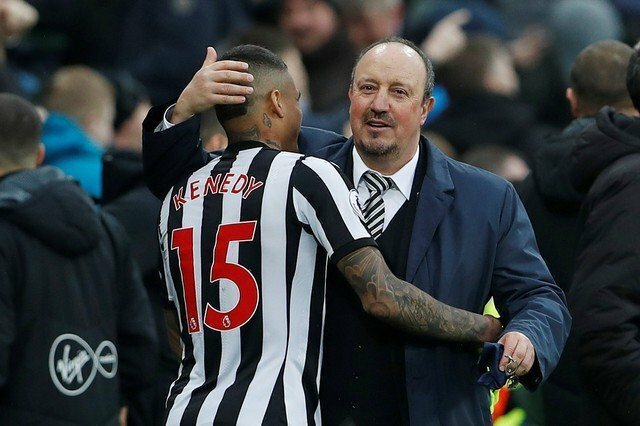 Benitez has an exceptional knack of connecting with fans, and the relationship he forged with fans at Liverpool is being replicated on Tyneside. The Spaniard was relegated upon arrival, and brought the team back up in style at the first time of asking. Despite clashes with the board over the lack of transfer dealings, Benitez seems content on Tyneside and has shown no clear signs to ditch the club. Now, with another six pointer to come at the end of the month vs. Huddersfield, Newcastle could find themselves clear of the relegation scrap going into the final months of the season. In Newcastle fans’ minds, there’s only one man to thank.